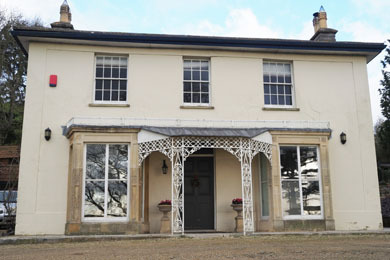 This 18th century georgian house is set within its own grounds of landscaped gardens and lawns. 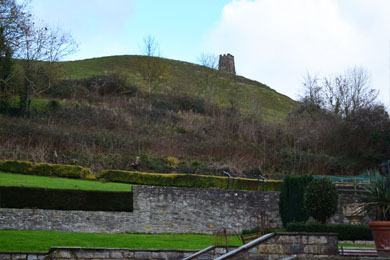 Melrose House is ideally situated at the foot of Glastonbury Tor and within a stone's throw of Chalice Hill, the Rural Life Museum and Chalice Well Spring/Gardens - a 10 minute's walk to Glastonbury High Street and the Abbey. Set back off the road, there is plenty of private parking to the sides of the property. Recently refurbished and extended to a very high standard, Melrose now offers all ensuite accommodation including white fluffy towels and cotton sheets. All rooms offer tea/coffee facilities, TVs and all are spacious and quiet with wonderful garden views including a dove cot, gazebo in herbaceous border, rose garden with pergola. There is a choice of scrumptious cooked breakfasts using local produce when ever possible - breakfast room enjoys wonderful views up to Glastonbury Tor. We have a visitor’s lounge reading/sitting area - this enjoys views over Vale of Avalon. There are garden table and chairs available for guest's use - why not enjoy sitting out by garden pond listening to nature at its best.